Sometimes it's handy to be able to easily extract a list of email addresses from your Outlook PST or OST file. The 'old fashioned' way of doing this is to export the mailbox to a CSV file, and only include email addresses as a field. But with large mailboxes, this can be time consuming and cumbersome, and outlook will often include internal sender ID's instead of email addresses, which are not overly useful. This application perform a few simple tasks required to extract a listing of email addresses (and a counter for how often each is used). Which email addresses does it use? Currently the application extracts each message's sender email address, and it also iterates through all CC'd addresses. One limitation is that your email address is likely to be in the list of recipients (how else would you have received the message! ), so it is likely your address will have the highest counter value. It is relatively trivial to exclude your own email address - simply ammend the add_address_to_list() function to check for your address and not add it if found. Firstly, create a C# console application in Visual Studio, targeting the .NET 4.5 or higher framework. The application makes use of the Microsoft.Office.Interop.Outlook assembly, so you'll need to add this as a reference in your project. The Outlook Primary Interop Assembly (PIA) Reference provides help for developing managed applications for Outlook 2013 and 2016. It extends the Outlook 2013 and 2016 Developer Reference from the COM environment to the managed environment, allowing to you interact with Outlook from a .NET application. You also need to have Microsoft Outlook installed on your PC - otherwise the Interop assembly has nothing to talk to. Before we can go through each folder and email in Outlook, we need to find an actual account, and build the root folder from this. The root folder is in the format \\foldername\, and the inbox is located one level below this, at \\foldername\Inbox\. To do this, we simply iterate through the Outlook.Application.Session.Accounts collection. From these, we can derive the root folder name. Using the function below, we initially pass it the root folder. It then looks for any child (sub) folders, and passes this to itself recursively, following the folder structure until it reaches the end. Using the function below, we retrieve the sender address, and then iterate through the recipients collection, passing all the addresses found to a function add_address_to_list. The function simply searches a dynamic array to see whether the address has been found previously, and if so, it increments it's counter. This keeps track of how many times an email address has been found. If the function can't find the address in the array, it adds it. I've tested this code on mailboxes hosted with an on-premises Exchange 2013 environment, Office 365 and a POP3/IMAP mailbox as well - all functioning exactly the same. 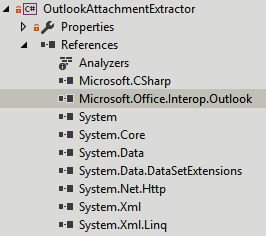 The links below provide more information on how to use the Outlook Interop service.